Do you ever just want more happiness in your life? Do you ever long to laugh, giggle, smile and feel good? Well, you’re in luck because today I’m going to show you how you can make your life super awesome with a little something called Laughter Yoga. Okay… so what is Laughter Yoga? Laughter Yoga is a unique form of group exercise where anyone can laugh for no reason! You don’t need jokes, humor, or comedy to participate in laughter yoga (though funny faces and silliness can definitely be involved). Laughter is initiated in the group through various exercises and soon turns into real, contagious laughter through eye contact and childlike playfulness. It’s called Laughter Yoga because it combines laughing with yoga breathing techniques, not because you’ll be doing any downward facing dog poses. However, stretching can be a part of laughter yoga sessions. This combination of laughter and yoga breathing brings more oxygen to the body and the brain, while expelling stale air in the lungs. This makes one feel more energetic and healthy after practicing laughter yoga. Laughter Yoga is based on scientific research, which states that the body can’t distinguish between real and fake laughter, if done with willingness. You get the same benefits either way. So, even if you aren’t feeling particularly joyful, you can stimulate laughter and eventually it will become real, making you feel much more awesome. You can read up on the latest research on Laughter Yoga at LaughterYoga.org. It was started in 1995 by Dr. Madan Kataria in a Mumbai park with just 5 people in India. Since then, Laughter Yoga has exploded! There are now over 1,000 laughter clubs in over 100 countries around the world. So, you know why laughter is important, but why do you need laughter yoga? Laughter should be sustained for at least 10-15 minutes to get the maximum health benefits. When was the last time you laughed for 10-15 minutes on command? Probably never, unless you’re just naturally giggly. This is why you should practice laughter yoga! You can use the exercises to stimulate a sustained 10-15 minutes of laughter. Since it is a form of exercise, you can laugh as long as you want. When we laugh throughout the day, it’s usually only for 3-4 seconds at a time. This is not nearly long enough to get the full benefits of laughing. Laughter should be deep and hearty laughter from the diaphragm. It should be a big belly laugh, which is not always socially acceptable. Laughter yoga provides as safe environment to belly laugh to your heart’s content! Don’t leave your laughter to chance. Laughter yoga is laughing unconditionally. You don’t have to wait for something funny to happen. You make laughter happen at any time. If you leave laughter to chance, based on humor, it may not happen. Use laughter yoga to be sure that you get the health and mood boosting benefits of laughing in your life. How Often Should You Laugh? Just like any other type of exercise, you may want to take precautions if you have certain medical conditions. Including hernia, incontinence, hemorrhoids, heart problems, chest pain, pregnancy, major surgeries, epilepsy, cold and flu, or severe backache. If you have any of these conditions, first consult your doctor before practicing Laughter Yoga. Laughter Yoga has sooooo many health benefits! The best part is that you can start feeling the benefits of laughter right away. It is especially good for increasing energy, reducing stress-related illnesses, and balancing your emotional state. Research has shown that laughing causes a kind of “internal jogging” that massages your internal organs and increases circulation, which flushes your body of toxins and allows you to operate at peak performance! Laughter yoga is a healthy exercise that brings more oxygen into the body, reducing physical, mental, and emotional stress all at the same time. Laughter yoga strengthens the immune system and, according to my training manual, may help a variety of conditions, including hypertension, heart disease, diabetes, depression, arthritis, allergies, asthma, bronchitis, backache, fibromyalgia, migraine headaches, menstrual disorders, cancer and many others. Laughter yoga will improve relationships because laughter is a positive energy that allows you to connect with others more easily. Laughter yoga gives you a positive attitude, even in tough times, by increasing your optimism and positive mental state. Do a one minute laughter challenge! Start at minute 8:45 of the episode to join in on the laughter challenge! We are going to laugh for one minute straight for no reason at all, other than I told you to! Make sure that you are somewhere you can do this privately, otherwise you will probably get some pretty interesting looks from other people. If someone else is around, get them to join in with you! It’s much easier to do a laughter challenge with others. 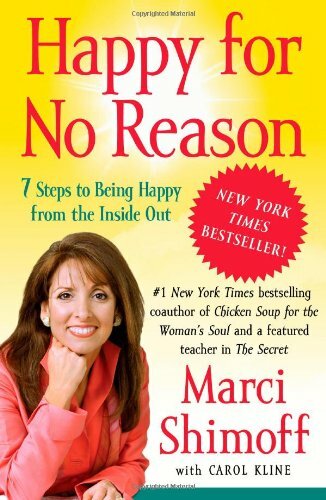 Want more fun in your life? A vision board is a visual representation of your goals, dreams, inspiration, and desires. It’s a tool to help you visualize what you want in life. 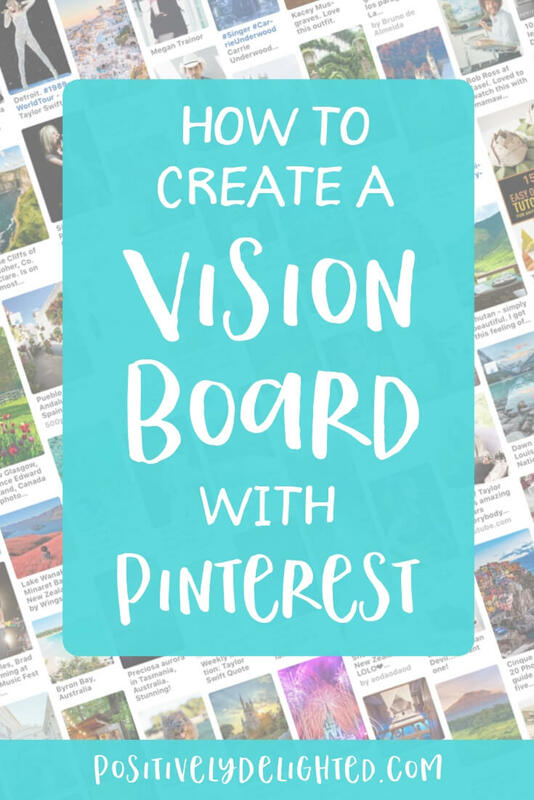 Usually, a vision board is a physical board, like a corkboard with printed images, but for these digital times I wanted to make an updated version of a vision board that you can take anywhere! Since Pinterest is awesome and has hundreds of thousands of images to pin from, it seemed the perfect tool to use. When I was in high school, I created a picture that said "Senior Class of 2010". I was homeschooled at the time and about half a year "behind" compared to the normal school year, due to our RV travel lifestyle. To graduate by the end of 2010 would mean that I would have to complete 2 years of school in one year. I had no idea how I was going to do this (and my parents definitely didn't see how it would happen), but every day I woke up and that sign was the first thing I saw. In the next few months, I discovered the possibility of taking the GED exam. If I passed that one test, I would be done with high school forever! I made a deal with my parents that if I could skip my senior year, I would study completely for the SAT exam to get into college and take the GED to finish high school. In December of 2010, I completed the GED exam and received my certificate in January. I was able to enjoy the next 7 months to study all kinds of awesome subjects that I'd always wanted to study, play shows, volunteer, and travel more before college. When you focus on what you want, you'll start to notice things you didn't see before. You'll find a path to where you want to go. You don't have to know the "how" in the beginning, just focus on what you want. The how will follow. So let's start making things happen! If you could be, do, or have anything, what would it be? Think of all areas of your life and get really specific. What inspires you (places, books, songs, movies, favorite animals, etc)? Who do you look up to (business owners, influential leaders, singers, actors)? Step 2: Search for photos! Travel: Look for photos of the places you want to go. Do you want to spend time on the beach in Bali? Pin photos of the beach in Bali! Or maybe you want to go hiking in the Grand Canyon. See if you can find really beautiful photos that resonates with you. Health: Search for the type of foods that you want to eat, the clothes you want to wear, or the exercises you want to do. Career: Find photos of the type of job you want, the space you want to work in, or articles about your ideal job. Family: Search for photos of families having fun together, activities to do together, or photos of family vacations. Love: Look for photos of happy couples, date ideas, engagement photos, or wedding photos. Friendship: Find photos of girl’s weekends, friendship quotes, or photos of friends having fun together. Experiences: Search for the specific experiences that you would like to have. If you want to paddleboard on a lake, have a mermaid photoshoot, be a Disney princess, climb a mountain, jump out of a plane, or take hammock naps, put it in your board! Role models: Find photos of your role models for all areas of your life. If you are a singer, look for photos of your favorite singer performing or showing personality. If you are a girl boss, look for photos of your favorite female CEOs. On my vision board, you will find photos of DisneyWorld, beautiful places around the world that I want to visit, and things I want to learn (like reiki, origami, salsa dancing, etc). 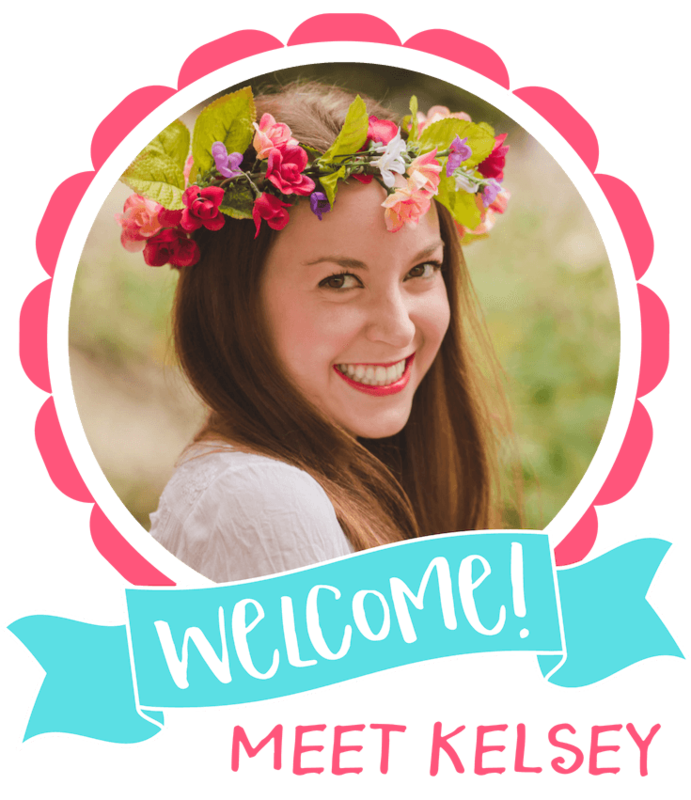 You’ll also find people who inspire me, such as Kacey Musgraves, Dolly Parton, Hunter Hayes, Emma Watson, and more. Then, you’ll see some of my future desires, like pictures of loving couples in wedding photos and adorable families on vacation. Other photos are just for fun, like photos of my favorite animals making silly faces. The point is that you want to have photos that make you smile and get you excited for your future. Click here to see my vision board! My vision board holds images of my dreams, role models, and reminders of what i'm working towards. Set aside time every day to revisit your vision board. Spend 5-10 minutes looking through your photos and visualizing yourself having those experiences. See yourself hanging out with your role models and learning from them. Visualize yourself visiting the places on your bucket list. Really try to include your senses. For example, if you are on a beach, hear the waves rolling onto the sand, feel the sand beneath your fingers and the wind on your face, and smell the salt in the air. Each photo will become a movie in your mind. You can create your movie however you want to. Have fun with this! Take your time to set up your visualizations in the beginning and over time, they will become easier to recall. Then, whenever you have some free time (waiting in line at the doctor’s office, on a break at work, etc) you can recall some of your visualizations and feel the feeling of having it now. Once you have these images in your mind, feel the emotion that you will feel when you really have it. Believe that it is yours. 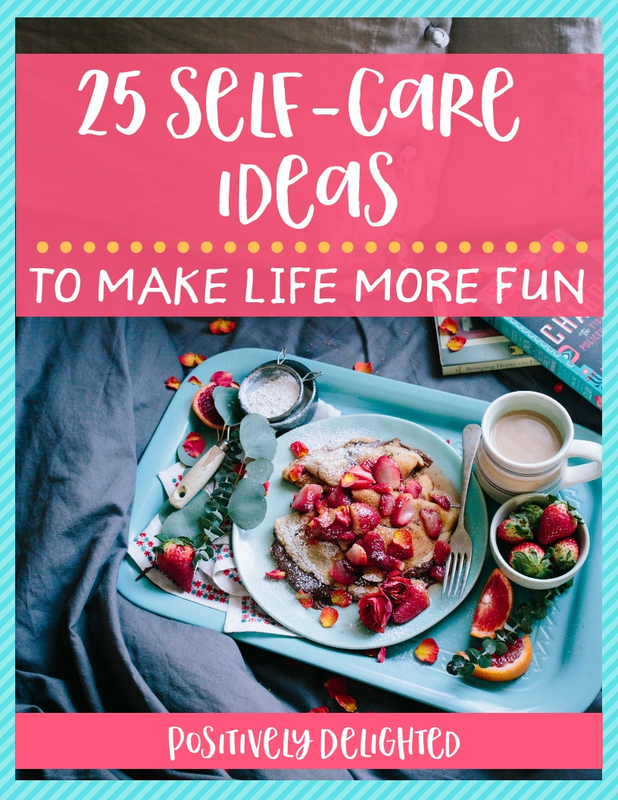 Treat yourself with these fun self-care ideas!